ELANGAPITIYA VILLAGE, Sri Lanka - Soldiers and police used sticks and bare hands Wednesday to dig through enormous piles of mud covering houses in three villages hit by massive landslides in central Sri Lanka, with hundreds of families reported missing. By evening, rescuers had pulled 17 bodies from the mud and debris unleashed by several days of heavy rain across the island nation. Officials said the extent of the tragedy was still unclear, but the Sri Lankan Red Cross said at least 220 families were unaccounted for. Heavy fog, rain, electrical outages and the loose ground were complicating efforts to search for survivors. As night fell, the rescue operation was suspended until dawn. Officials warned that, with rain still falling, more landslides could occur in the area. 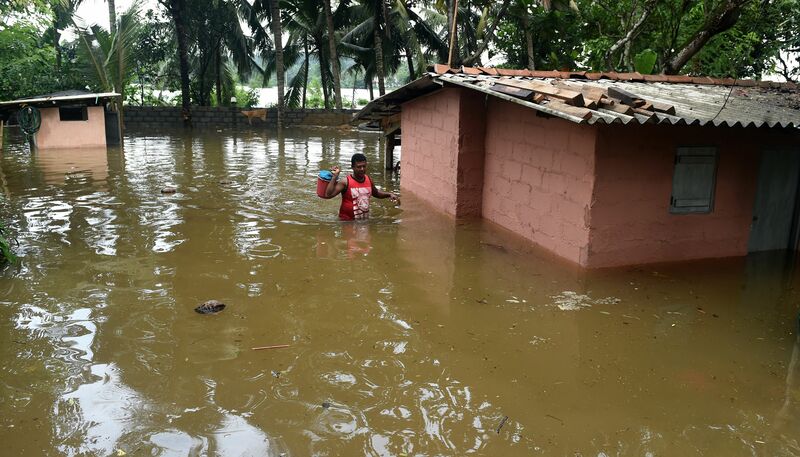 Villagers said torrents of muddy water, tree branches and debris came crashing down around their homes Tuesday in the three villages, located at different heights on the same hill in Kegalle District, about 45 miles north of Colombo. Near the village of Elangapitiya - furthest down the hill - soldiers carried bodies to a school, where families waited for news of missing loved ones. Officials could not give the populations of the villages of Siripura, Elangapitiya or Pallebage, but such villages typically include 1,000-1,500 residents. Sri Lanka's disaster management center reported 11 deaths from lightning strikes and smaller landslides elsewhere in the country on Monday and Tuesday. Nearly 135,000 people have been displaced and are being housed in temporary shelters. Mudslides are common during the monsoon season, with heavy deforestation to clear land for agriculture leaving the countryside exposed.